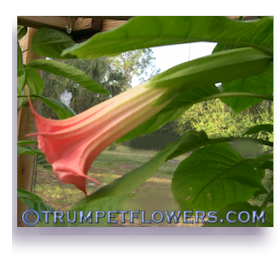 Trumpetflowers own specially blended Foliar Feed, or Brugmansia Tea. 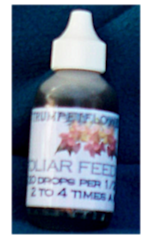 A super concentrated liquid foliar feed mix that can be used once weekly for it&apos;s full potential. Your plants will bloom bigger, more often, and have bright green leaves that are larger and stronger than without using a foliar feed. With this mixture, you will not need kelp powder, superthive, and all of the other ingredients that go into a good foliar feed. Use 3 to 4 drops per 1 Quart. 60 ml. bottle does approximately 180 - 1.75 Liter sprayings. (That is the size of Flo-Master Pressure Sprayer) That&apos;s more than enough to last a full year or more, depending upon your collection size. Store in cool, dark place for best results. Shipping available to 48 States. Not Alaska or Hawaii. 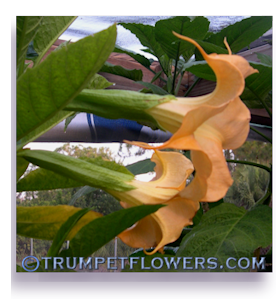 This entry was posted in November, 2013 and is filed under Cultivar Sales.